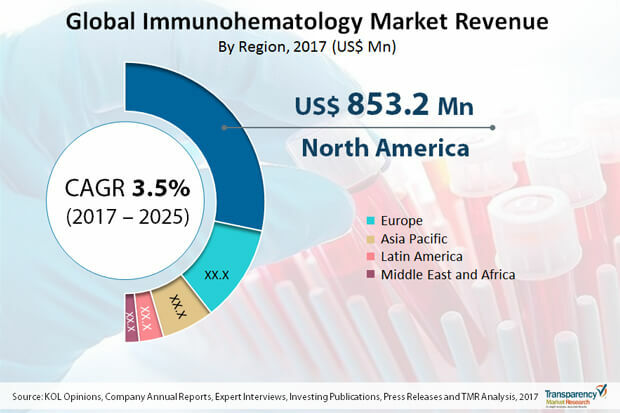 According to a new report published by Transparency Market Research (TMR) titled “Immunohematology Market: Global Industry Analysis, Size, Share, Growth, Trends, and Forecast, 2017–2025”, the global immunohematology market was valued at US$ 1,462.1 Mn in 2016 and is projected to expand at a CAGR of 3.5% from 2017 to 2025 to reach value of US$ 1,991.8 Mn by 2025. This report offers a thorough understanding of the immunohematology market across the globe, its key trends, drivers, restraints, and opportunities. Rising awareness among people in developed as well as developing countries is expected to drive the global immunohematology market in the near future. Increasing health care expenditure and rising worldwide concerns about medical safety are also driving the global immunohematology market. The Asia Pacific region has witnessed gradual adoption of new immunohematology technologies, increasing health care expenditure, and changing dynamics of the in vitro diagnostics industry in the region. The market in APAC is anticipated to expand at a CAGR of 4.4% from 2017 to 2025. The global immunohematology market has been witnessing a significant shift from manual systems toward automated systems. The rate of adoption of automated systems by laboratories is increasing. This has augmented the demand for automated analyzers. In addition, the increasing focus on efficiency and data precision promotes growth of the market. The adoption of automated systems has boosted the throughput and reduced the burden of routine tasks. A substantial number of clinical trial studies are in process to innovate new technologies and procedures for blood typing. Research and development programs for the advancement of new products in immunohematology are expected to provide significant opportunities to the immunohematology market in the next few years. The modern methods of blood banking offer rapid results and better accuracy. These methods enable establishing of strong monitoring plans and quick tracing of compatible blood donors. Advancements in the immunohematology technology have led to rapid development in the diagnostic approach toward in vitro study of the antigen–antibody interaction, facilitating improvement in the compatibility reaction between the donor’s blood and the recipient’s blood. Technological improvements in devices and reagents available for immunohematology testing have enabled clinicians to provide proper emergency assistance to patients. These technological advancements include development of automated systems which make the identification process easier and provide more accurate results as compared to manual systems. Sophisticated antiglobulin screening instruments and assays are well-recognized and validated for proper blood typing. However, high costs associated with these systems and assays present a significant challenge for the market. Moreover, cost of setting of a sophisticated, dedicated laboratory with advanced tools can be substantially high, which makes the market entry of new and small players difficult. This factor is projected to hamper the global immunohematology market during the forecast period. Moreover, people in developing economies such as India and China are opting for private insurance for their medical needs. Increasing disposable income, rising health care awareness, and developing health care infrastructure have led to steady rise in the demand for better diagnosis and treatment measures in these countries. The global immunohematology market has been segmented in terms of product, application, end-user, and geography. Based on product, the global immunohematology market has been segmented into analyzers and reagents. The analyzers segment has been sub-segmented into automatic and semi-automatic/non-automatic immunohematology analyzers. The reagents segment is expected to dominate the immunohematology market during the forecast period. This is attributable to the rising number of customized reagents used in blood typing and antibody screening processes. Moreover, increasing demand for blood and blood products significantly boosts the demand for reagents and assay kits. Growing trend of consolidation among diagnostic laboratories and rising demand for preventive care and diagnosis are leading to high-volume processing, which augments the demand for high-throughput automatic analyzer systems. Based on application, the global immunohematology market has been segmented into blood typing and antibody screening. Antibody screening test is a clinical procedure usually performed in a blood bank, hospital laboratory, or clinical laboratory before blood transfusion in order to detect the presence of unexpected antibodies, which can lead to an undesirable response during the transfusion procedure. Based on end-user, the market has been segmented into hospitals, academic & research institutes, diagnostic & reference laboratories, and blood banks. The hospitals segment is expected to remain dominant during the forecast period. Geographically, the global immunohematology market has been segmented into five regions: North America, Europe, Asia Pacific, Latin America, and Middle East & Africa. North America is projected to be the largest market for immunohematology during the forecast period. High adoption of advanced technologies and a wide base of diagnostic laboratories and blood banks are factors responsible for the major share held by North America in the global immunohematology market. The Asia Pacific region has witnessed gradual adoption of new immunohematology technologies, increasing health care expenditure, and changing dynamics of the in vitro diagnostics industry. These factors are leading to adoption of new technologies by hospitals and diagnostic laboratories in the region. Increase in the disposable income of people in emerging markets in Asia Pacific such as India and China is leading to rise in the health care spending. Moreover, adoption of advanced treatment options is increasing in developing regions, which provides growth opportunities to the global immunohematology market. One of the most significant factors driving the immunohematology market in developing countries such as India and China is the availability of superior treatment facilities at lower prices compared to western countries. This attracts patients from high-prevalence regions such as the U.S. and Europe to these countries. Growing medical tourism industry in developing economies is anticipated to provide growth opportunities to the market for immunohematology in the next few years. Major companies operating in the immunohematology market and profiled in the report are Bio-Rad Laboratories, Inc., Grifols S.A., Ortho Clinical Diagnostics, IMMUCOR, INC., Abbott Laboratories, Beckman Coulter, Inc., Thermo Fisher Scientific, Inc., Becton, Dickinson and Company, Merck KGaA, and Siemens Healthineers. Bio-Rad Laboratories dominates the market, due to strong penetration of its flagship products in the global immunohematology market.